Gratitude is the essence of our lives. We have been given so much. We are connected in ways beyond what the eyes and ears can sense. Beyond what the mind can comprehend. and we continue on our way. 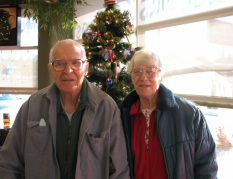 Our school is a daily, living testimony of gratitude to Wilberth. Wilberth grew up in this small rural town and always looked for ways to support the people here. 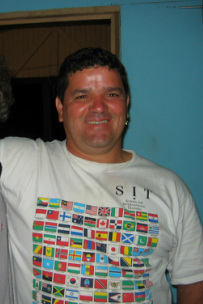 After marrying Mary and living in Japan and Brazil, he envisioned the school as a place where people from this and other neigboring towns could learn language and skills that would give them more opportunities and improve their lives. He built it, together with a few friends, with his own two hands and his gentle, loving presence is both deeply missed and cherished as we remember him with gratitude. 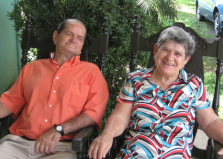 Mary's parents George (1926-2010) and Phoebe Scholl have provided unwaving support in many ways for our work here in Costa Rica. Though never able to visit the school, they have offered so much from a far that we feel their love and presence in our lives here and are very, very grateful! Wilberth's parents Victorino Gonzalez Arias and Flor de Maria Rodriguez Carvajal have done many things to support us. Not only gifting the land that the school is on, but helping with many aspects of running our lives here. Of course we are most grateful to them for having Wilberth as a son! 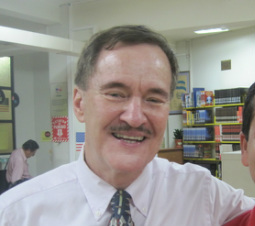 When Michael Rudder was the Regional English Language officer for the U.S. State Department in Costa Rica. He began to support us by helping us get grants to fund scholarships for Latin American Teachers. He continued to help us for 8 years. Michael has always believed in our work and has been instrumental in our health and development. I (Mary) am proud and grateful to be from the United States and to be able to participate daily in the positive work that my country is doing and supporting to make the world a better place for all. The U.S. State Department, Western Hemisphere Affairs and the Office of English Language Programs and the Regional English Language Officers have collaborated with each other and with us to provide grants to our institution to support scholarships for almost all (over 500!) of the Latin American teachers who have come to our programs. Course graduates leave Centro Espiral Mana knowing that our government and people in the U.S.A. care about their wellbeing and about education in their countries. Thank YOU U.S. State Department and the people that make it work! Here's a video made for two of our trainers, Roger and Amanda, from the participants of the SIT TESOL Certificate Course in December 2012.